Today is the last day of the 61st session of the Commission on the Status of Women (CSW61), a UN forum that is usually a global mobilising space for women’s rights. But this year the CSW was different. This year, the CSW took place under the shadow of the United States’ escalated anti-immigrant, anti-refugee, and anti-Muslim policies. Specifically, the US executive order signed on 27 January banned all entry to the US for people from several countries, preventing many women from exercising their right to real and meaningful participation in international decision-making. It compromised the very purpose of the UN Charter and legitimacy of the process. Shortly after the installment of the US executive order, WILPF took the lead on denouncing women’s exclusion at the CSW61. We simply refused to engage formally in the CSW. We moved our planned CSW events with our partners in Syria, Libya and Yemen to the Human Rights Council Geneva, shared an open letter to ambassadors in New York and Geneva, and worked with our grassroots network and partners to raise awareness of #MissingVoices at the CSW61 in diverse spaces. We also provided alternative spaces for excluded women to share their expertise and raise their voices. Our action got noticed, and during the CSW61 we have from the sidelines observed how the issue of women’s missing voices was raised by governments, civil society and the UN broadly to the highest levels. WILPF raised concerns about #MissingVoices at the CSW61 early. 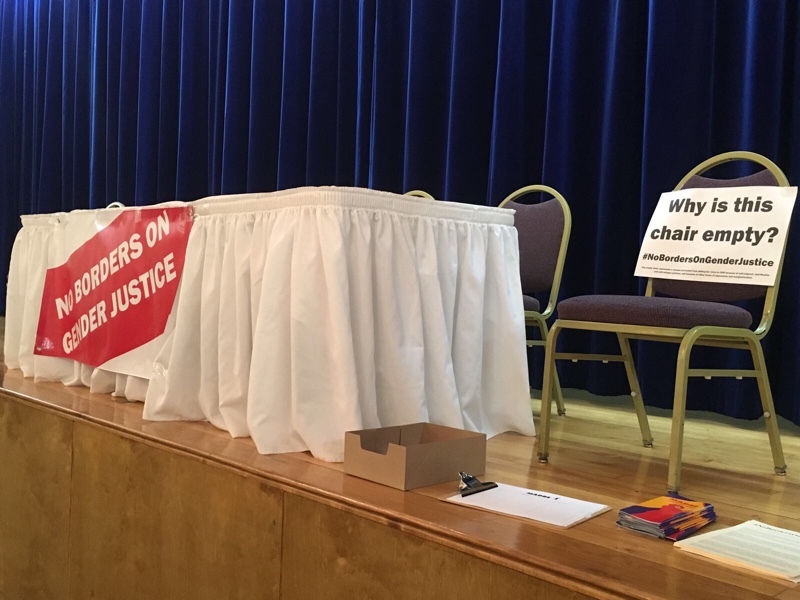 Doing so allowed us to encourage our partners and coalitions to leave empty chairs for those who were unable to come to New York. The issue gained significant visibility among civil society, with some of our partners (MADRE, Just Associates (JASS), CWGL, AWID, Urgent Action Fund, Women in Migration Network and Outright Action International) spearheading the #NoBordersOnGenderJustice Initiative and a rally, as well as statements from parallel and side event speakers noting the impact of the absence of #MissingVoices. 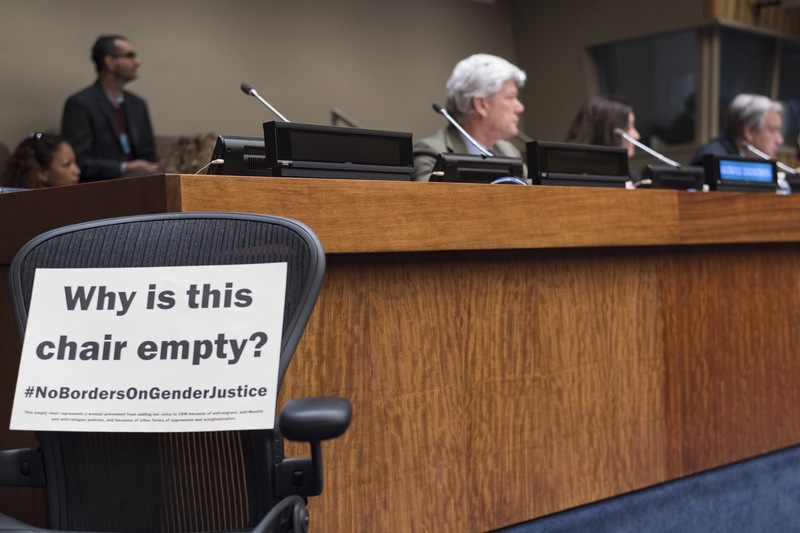 This included an initiative which set aside empty chairs on panels to bring attention to the fact that not everyone was there, and the need for women facing multiple discriminations to be at the center of conversations on human rights at the CSW and beyond. As part of our work to improve multilateral actions, WILPF called on States to take up the issue of women’s meaningful participation by supporting a coalition statement (by MADRE, AWID, JASS, Outright, CWGL, Urgent Action Fund, and Women in Migration Network) calling on governments to include language in the CSW’s Agreed Conclusions outcome document affirming the need to remove all barriers that directly and indirectly inhibit women’s full, equal and effective participation. The final Agreed Conclusions outcome document addressed meaningful participation of women in decision-making as a key in breaking the cycle of discrimination and violence. It will still be critical moving forward to ensure that they take action to implement commitments on overcoming obstacles to women’s meaningful participation integrated in the international human rights law. It will also be important to address thematic issues such as women’s economic empowerment in the changing world of work in a way that addresses root causes of conflict and violence, not just by “adding women” to current systems of inequality, exploitation and violence, but by trading political economies of violence and war for political economies of peace and justice. The CSW61 is now ending, but WILPF will ensure that the conversation on women’s meaningful participation will continue beyond the CSW. Seen from WILPF’s perspective, the US travel ban is just the latest in a series of obstacles to women’s meaningful participation in international fora. We are on a slippery slope of exclusion, and it is important that civil society organisations, such as WILPF, the UN and Member States take immediate measures to change direction. Without women’s real experiences being part of the UN debates, the reality of their lives, including during conflict, cannot be accurately be brought to the attention of decision-makers, including policy drafters and Member States. And without women’s inclusion, women’s right to nondiscrimination and participation cannot be upheld. 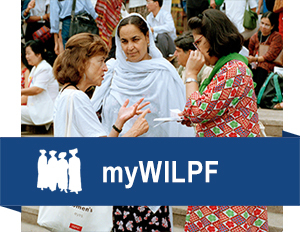 WILPF is therefore planning a series of initiatives in order to overcome intransigent obstacles to women’s meaningful participation in the UN system. The first event in this series is a convening on overcoming obstacles to women’s meaningful participation at the UN in Geneva on 26-28 April 2017.
examine the existing mechanisms on gender integration and develop concrete proposals for improvement or reform. consider how to strengthen participation and the monitoring of implementation by Member States and the UN. The US travel ban is just the tip of the iceberg: ongoing obstacles continue in the shape of visa rejections, sidelining on panels, lack of action on the women, peace and security commitments, and otherwise. An empty chair is just one part of the conversation. It is time to tackle these issues directly.